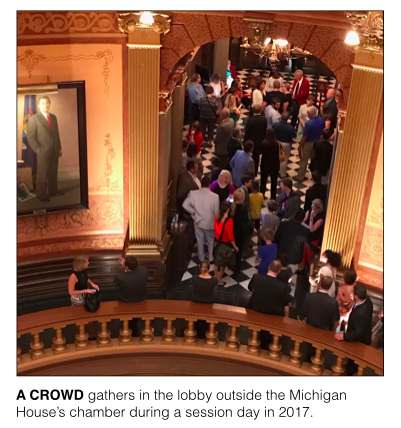 LANSING — Lobbyists reported spending a record amount trying to influence Michigan officeholders in 2016. Over the first seven months of 2017, they matched their record pace. From Jan. 1, 2017, through July 31, 2017, lobbyists reported spending a total of $21.8 million in Michigan, about the same total that they spent over the first seven months of 2016, $21.7 million. The numbers indicate the business of trying to sway public officials in Lansing isn’t getting any smaller. The $21.8 million in spending so far in 2017 came as lobbyists introduced themselves to 41 first-term Michigan House members who took office in January, as lawmakers approved a $56-million state budget and as the Legislature signed off on new tax incentives for development projects. By the end of last year, lobbyists had spent about $39.9 million for 2016, a record amount. The previous high for lobbyist spending in a single year came the year before in 2015, when lobbyists spent $38.6 million. While lobbyist spending declined at the federal level, lobbyist spending in Michigan has been trending upward for longer than a decade. In 2001, lobbyists spent only $18.4 million total for the entire year, less than the reported spending for the first seven months of 2017. The spending totals include payments to individual lobbyists to influence state officials, purchases of food and drinks for state officials, mail campaigns to sway officials and purchases of trips for officials. 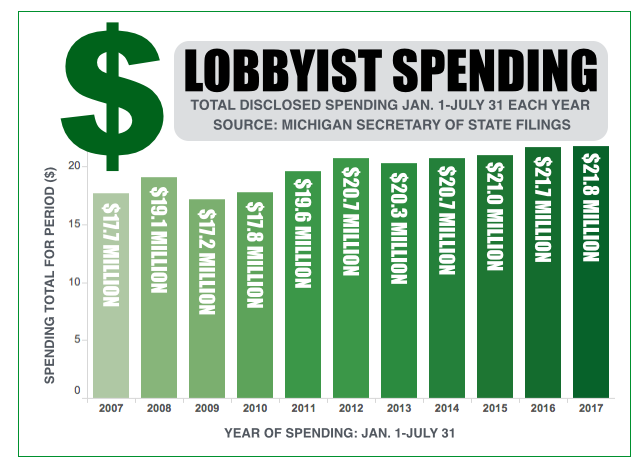 Lobbyists disclose information on their spending only twice a year in Michigan. One report is due Jan. 31 and covers the last five months of the previous year. The other is due on Aug. 31 and covers the first seven months of the current year. State law requires registered lobbyists to report their overall spending, their spending on food and drink and their spending on mail. For the first seven months of 2017, Michigan’s nearly 3,000 lobbyists and lobbyist agents reported spending $541,527 on food and drinks and $13,471 on mail expenses. The Michigan Campaign Finance Network will release a report on food and drink purchases by lobbyists later this week. State law doesn’t require lobbyists to disclose how much they’re spending trying to influence particular bills or rules. It also doesn’t require multi-client firms that represents numerous different interest groups to report how much they’re spending on behalf of each of their clients. Mutli-client firms dominate the list of top spenders on lobbying in the state. 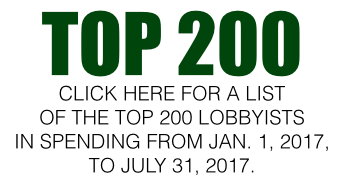 The top 200 spenders on lobbying for the first seven months of 2017 is available here. The top eight spenders on lobbying for the first seven months of 2017 were all multi-client firms. Four of them reported spending more than $500,000: James H. Karoub Associates ($877,340); Governmental Consultant Services Inc. ($871,315); Kelley Cawthorne ($620,80); and Midwest Strategy Group ($553,317). Those four firms employ about 40 individual lobbyists total. The top interest groups or businesses in spending were the Michigan Health & Hospital Association ($258,396), the National Federation of Independent Business ($197,360), Blue Cross Blue Shield of Michigan ($186,401) and the Michigan Credit Union League ($176,801). Those who increased their spending heavily in 2017 include Quicken Loans, which spent $159,476 over the first seven months of the year. See a related story for more information on Quicken Loans’ lobbying. MPM Enterprises, which operates Gun Lake Casino, reported spending $150,542 on lobbying so far this year, compared to only $30,108 over the same period in 2016. Similarly, the technology company Dell Inc. reported spending $65,000 on lobbying in Michigan over the first seven months of 2017. It reported no spending over the same period last year.